All 18 people inside the limo and 2 pedestrians were killed. 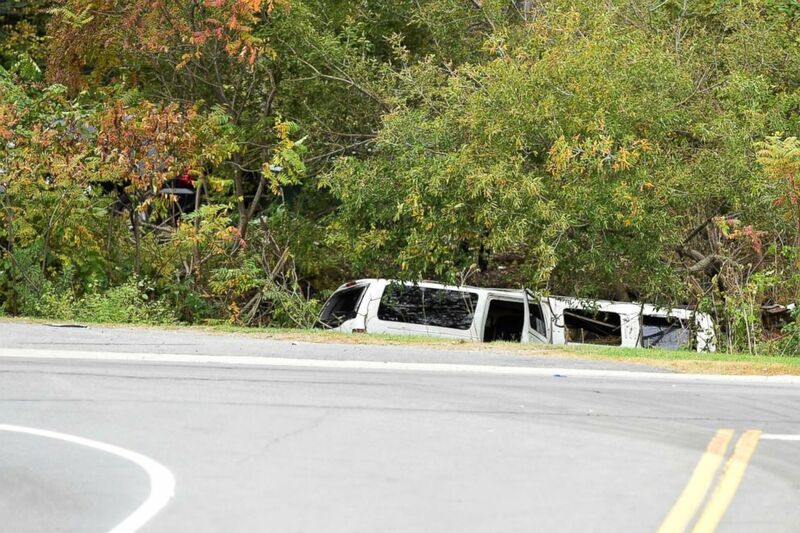 The limousine that was involved in a deadly crash in upstate New York failed an inspection by the state's Department of Motor Vehicles last month, according to Gov. Andrew Cuomo. 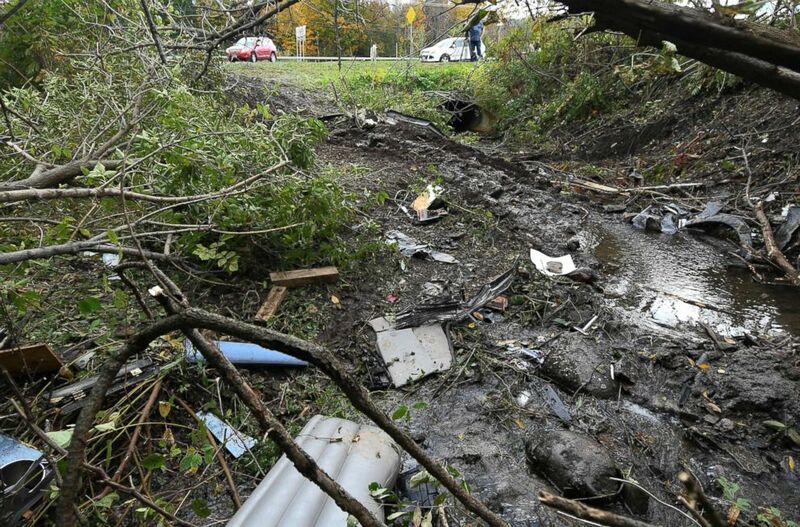 Additionally, the driver of the limousine, who died in the crash along with 19 others, did not have the appropriate driver’s license to be operating that vehicle, Cuomo said. 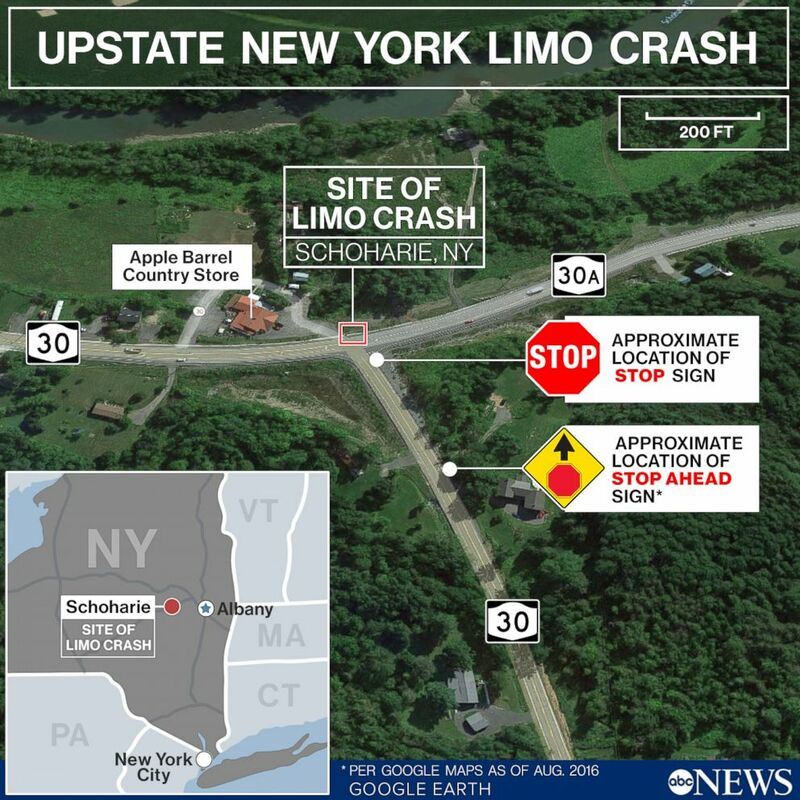 A law enforcement official told ABC News that the driver was named Scott Lisinicchia and lacked the proper license required to drive a vehicle that can hold more than 15 occupants. The state is seeking a cease-and-desist order to stop the limo company, Prestige Limousine, from operating until the investigation is concluded, Cuomo said. 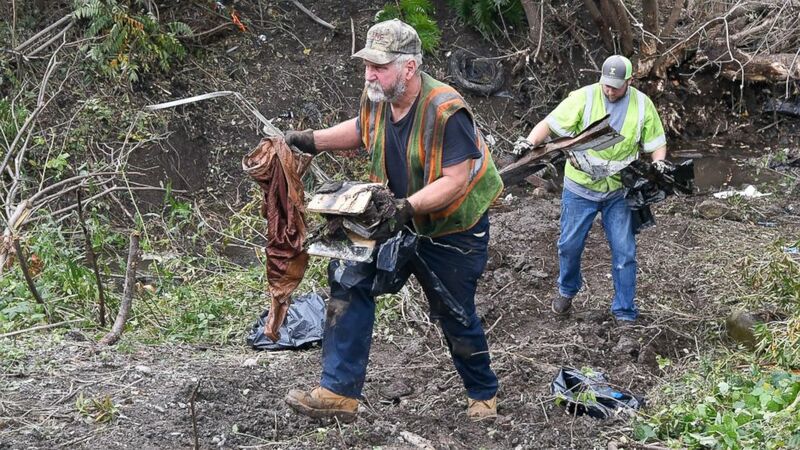 (Hans Pennink/AP) Debris scatters an area Sunday, Oct. 7, 2018, at the site of yesterday's fatal crash Schoharie, N.Y.
"The owner of the company, in my opinion, because of the legal consequences, had no business putting a failed vehicle on the road," the governor said. The registered owner is Shahed Hussain, who used to be an FBI informant, according to law enforcement sources and court documents. Hussain became an informant in 2002 after he was arrested on fraud charges while working for the state Department of Motor Vehicles, law enforcement officials said. He was caught helping immigrants cheat on driver’s tests and cooperated with the FBI in order to avoid deportation to Pakistan, the sources said. Hussain testified as part of two terrorism cases, including a 2009 sting operation that disrupted an alleged plot to bomb a Bronx synagogue. The other case was out of Albany and involved terrorism financing. Prestige Limousine said in a statement Monday that it is taking its fleet of cars off the road during the investigation. "Prestige Limousine extends its deepest condolences to the family members and friends of those who tragically lost their lives on Saturday. We are performing a detailed internal investigation to determine the cause of the accident and the steps we can take in order to prevent future accidents," the statement said, adding that the company representatives have met with state and federal investigators. Prestige Limousine has had vehicles inspected five times in the past five years and had four vehicles taken out of service, according to state Department of Transportation records. That rate is four times the national average, the records show. The company had not had any crashes over the last two years, according to the documents. 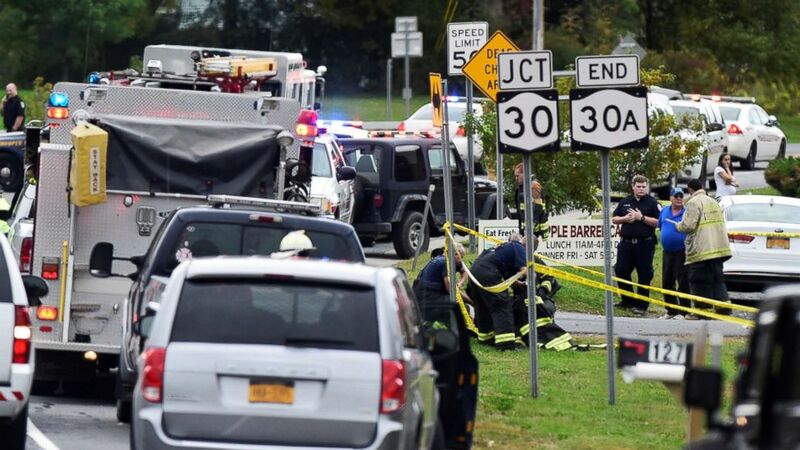 The crash, which took place near the town of Schoharie on Saturday Oct. 6, is the deadliest transportation crash in the U.S. since August 2009, said Robert Sumwalt, the chief of the National Transportation Safety Board said, adding that Monday marks the first full day of investigation. 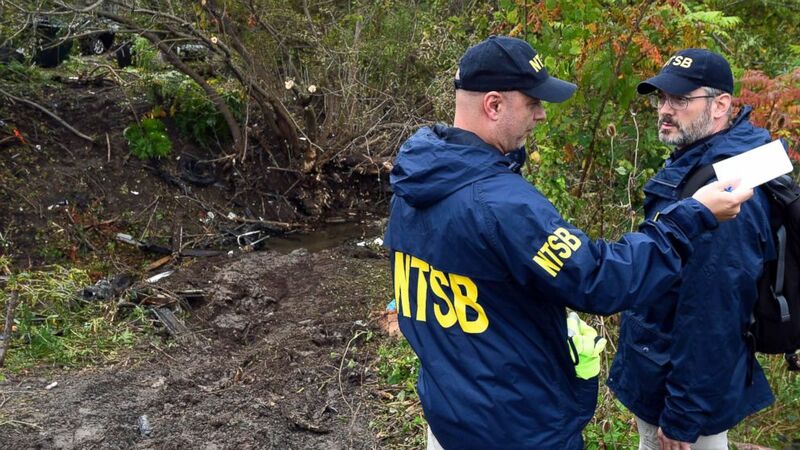 (Hans Pennink/AP) Members of the National Transportation Safety Board work at the scene of Saturday's fatal crash, in Schoharie, N.Y., Sunday, Oct. 7, 2018. He described the seating structure inside the limo, saying that in addition to the driver and passenger's seat before the partition, there was a rear-facing seat, long benches on either side, and then front-facing seats at the back. He noted that "some seats were equipped with lap shoulder belts," but he did not specify which. "At this point we're not sure if all seating positions were equipped with seatbelts," Sumwalt said, adding that they are also not sure if anyone in the vehicle wore them. Sumwalt said that there was "extensive damage done to the front of the car," and the engine compartment was pushed back, which gives "indications of high-energy impact." 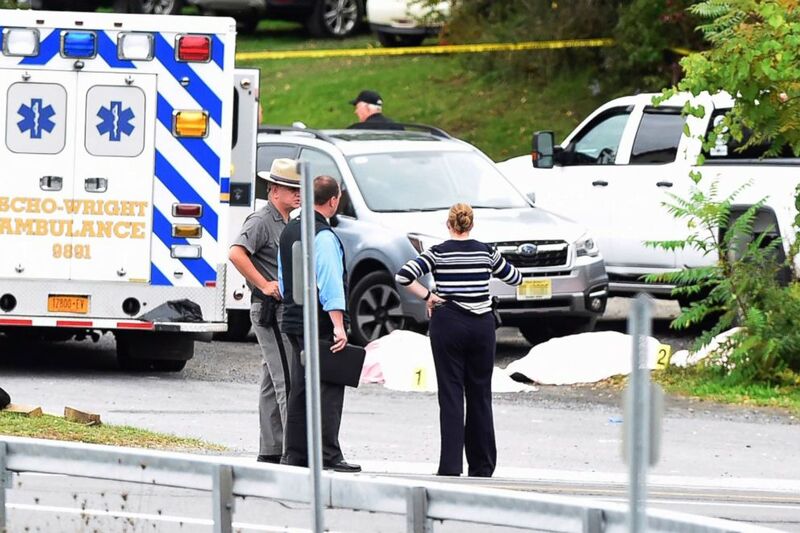 The safety of limousines has been called into question before, including recently when a grand jury in Suffolk County, New York, investigated the 2015 collision between a limo and a pickup truck that killed four women touring wine country on the North Fork of Long Island. Another four people were injured in that crash. The grand jury found that vehicles converted into stretch limousines lack safety measures typically found in passengers cars including side-impact air bags, reinforced rollover protection bars and accessible emergency exits. When the report was released in December 2016, then-Suffolk County District Attorney Tom Spota dramatically held up a hollow metal bar to demonstrate "all that stood between eight women and an oncoming pickup truck." Limousines are not manufactured by major car companies and there is no regulatory agency in the U.S. that ensures these vehicles are safe. Limousines actually start out as normal cars -- and in the case of the latest crash, a Ford Excursion -- and are then chopped up by second-stage manufacturers to extend the length of the vehicles. After these vehicles are extended, no crash tests are done and there are no mandated safety checks to make sure these vehicles are safe.